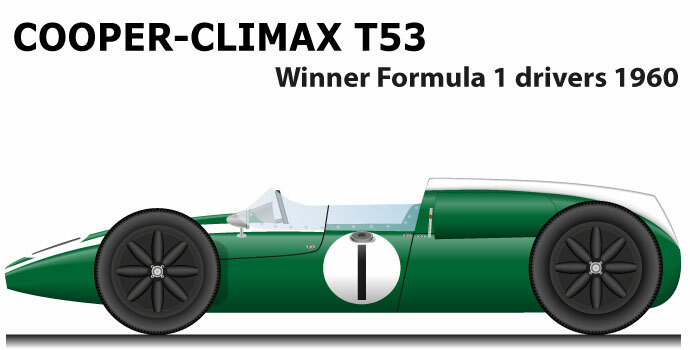 The Cooper Climax T53 is the winning car of the 1960 Formula One World Championship. After the surprising success of the previous year with the Cooper T51, the English team brings a new lower car and a five-speed gearbox to the track. The rear engine has revolutionized and all the teams accelerate the production times of their cars with the engine behind the cockpit, but Cooper still has an advantage. Jack Brabham with the Cooper Climax T53 wins the 1960 Formula One World Championship. For the Australian rider is the second consecutive title, after a start in season with two withdrawals, the current champion puts five consecutive wins in: Holland, Belgium , France, Great Britain and Portugal, only his team-mate Bruce McLaren with the victory in Argentina and Stirling Moss on Lotus winner in Monaco and USA try to keep up. The Cooper thanks to the two pilots also wins its second consecutive constructors title.